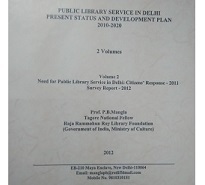 A survey of readership in public libraries in Sikkim with recommendation for development. To promote reading in public libraries. List of Subject Headings for Indian Publications and Documents on India. A research cell along with a special library on Library & Information Science and a statistic unit supported by a computer unit are providing necessary input to its various activities. About 5000 important books and journals on Library & Information Science and allied fields have been acquired in the library. Besides carrying on Research Projects on public library or allied subjects, the Research Cell renders advisory and consultancy services whenever required. It has prepared and published a report on loss of books in libraries for the Government of India. Public Library Services in Delhi: Present Status and Development Plan 2010-20 with a greater emphasis on the development of a model public library system for the whole country. Library : Books and Socio Cultural Changes in West Bengal and North Eastern States with particular reference to the contribution of Raja Rammohun Roy Library Foundation. The Scheme has been introduced in order to invigorate and revitalise the various institutions under the Ministry of Culture (MOC) and other identified cultural institutions in the country, by encouraging scholars/ academicians to affiliate themselves with these institutions to work on projects of mutual interest. With a view to infuse fresh knowledge capital into the institutions, the scheme expects these scholars/academicians to select specific resources of the institutions to take up projects and research work that are related to the main objectives of these institutions and to enrich them with a new creative edge and academic excellence. The Scheme will be open to both Indian nationals and foreign citizens. The proportion of foreigners will not normally exceed one–third of the total Fellowships awarded in a year. The scope of the Scheme is to enable the identified cultural institutions engage scholars of outstanding merit, to work on research projects that unravel their unexplored resources. The institutions as well as scholars may identify areas to be explored, but the subject of research need not be confined/ limited to one institution. For purposes of convenience, monitoring, accounting and responsibility, one of the institutions listed in para 3 would be the ‘Nodal Institution’ for each project, and the Fellow will be attached/ anchored to that institution.